Some flavors just go together, like caramel and apples (have you tried my caramel apple recipe or my caramel apple cheesecake in a jar recipe? If not, you really need to do so!) And now it's time for a dessert that deserves the place of honor on any table at your dinner table – the Candy Apple Pie recipe! Inspired by this recipe, I wanted a recipe with a little more “wow factor” on a dessert table. 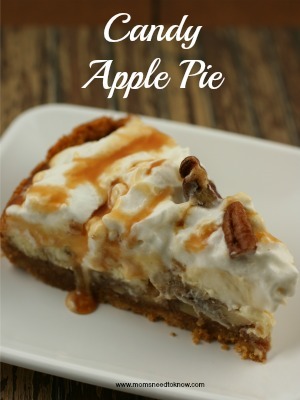 This candy apple pie recipe is very sweet so just a small slice will be good enough for most people! Serve it with coffee, tea or just a tall glass of milk! In a medium bowl, combine the graham cracker crumbs, sugar, cinnamon, and melted butter. Mix until completely combined and press into a springform pan (line the bottom with parchment paper first for easy removal) and up the sides of the pan. Bake crust for 8 – 10 minutes until slightly browned. Remove pan from oven and set aside until crust is completely cooled. 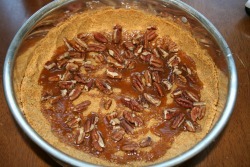 Pour caramel on top of crust and top with 1 cup of chopped pecans. 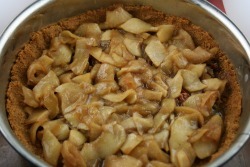 Top crust/caramel/pecans with fried apples. With a mixer combine cream cheese and sugar until smooth. Add the egg, lemon juice, lemon zest, and vanilla and beat for 1 minute or until completely smooth. Pour cream cheese mixture over the fried apples in in the pan. Bake for 30 minutes until an inserted knife comes out clean. Remove pie from oven and let cool. Refrigerate for 4 hours or until filling is cool and firm. 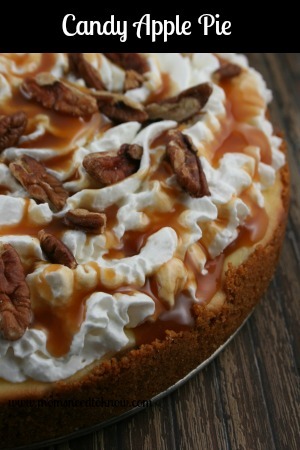 Top with whipped cream, caramel topping, and chopped pecans. Just be careful making this and bringing it to a party. One bite and everyone will be asking you to make it for them for every party! « Recyclebank | Earn 100 Points!